Please the whole family with The Birthday Celebration Combo. 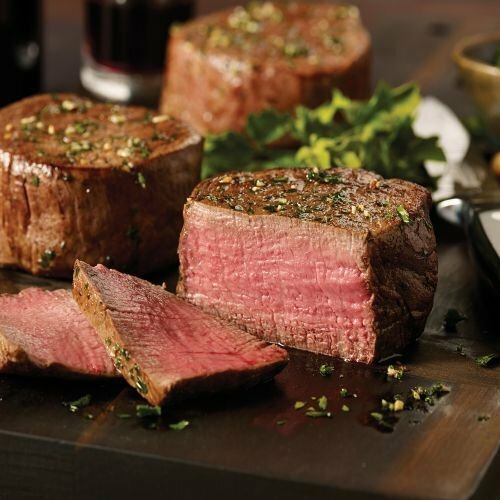 This assortment features all your family favorites including our world-famous Filet Mignons, beefy Top Sirloins, versatile Chicken Breasts, juicy Omaha Steaks Burgers and deli-style Gourmet Franks! We've also included our popular Stuffed Baked Potatoes as the perfect complement to your main course. INGREDIENTS: Beef; Beef; Chicken; Beef; Pork, Beef, Water, Nonfat Dry Milk, Salt, Corn Syrup, Sodium Lactate, Natural Spices, Dextrose, Flavorings, Sodium Diacetate, Paprika, Monosodium Glutamate, Sodium Erythorbate, Sodium Nitrite. Contains: Milk; BAKED POTATO WITH SHELL, WATER, SOUR CREAM (CULTURED CREAM, MAY CONTAIN ENZYMES, NONFAT MILK, WHEY, MODIFIED CORN STARCH, SODIUM PHOSPHATE, GUAR GUM, CARRAGEENAN, SODIUM CITRATE, LOCUST BEAN GUM, CULTURES, POTASSIUM SORBATE [PRESERVATIVE]), CHEDDAR CHEESE (PASTEURIZED MILK, CHEESE CULTURES, SALT, ENZYMES, ANNATTO COLOR), DEHYDRATED POTATO, BUTTER, BACON (CURED WITH WATER, SALT, SUGAR, SODIUM NITRITE, NATURAL SMOKE FLAVOR, SODIUM PHOSPHATE, SODIUM ERYTHORBATE, SODIUM ASCORBATE), CONTAINS LESS THAN 2% OF WHEY SOLIDS, NONFAT DRY MILK, SOY FLOUR, SALT, DRIED CHIVES, MONO AND DIGLYCERIDES, SODIUM ACID PYROPHOSPHATE, CITRIC ACID. CONTAINS: MILK, SOY.